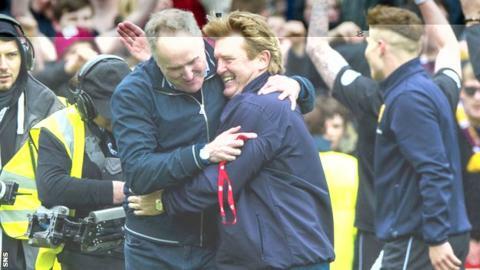 Stuart McCall suggested Aberdeen can have no complaints about the winning goal in the 1-0 win at Pittodrie that clinched Motherwell second place. The Dons were aggrieved at Craig Reid's late winner with suggestions of a foul on Jamie Langfield by John Sutton. However, McCall pointed to decisions against his side earlier in the season that went for Derek McInnes' men. He told BBC Radio Scotland: "If we've got anything today it's evened it up, there's no doubt about that." Aberdeen had the better of the 90 minutes, but two last-gasp challenges by Shaun Hutchinson denied Niall McGinn when the striker was one-on-one with goalkeeper Lee Hollis, and Jonny Hayes hit the bar for the Dons. As the home side struggled for a breakthrough, Reid won it at the death for the Steelmen when he bundled in the winner a minute into time added on. "I've tried to see it again," he said. "There were a lot of bodies in there, and there's a possibility it could have been a free-kick. "You have to go back to Russell Anderson's goal in the last kick of the game for them at Fir Park where he forearm smashes it in, and takes out [Jack] Leitch on the line which is a clear, clear foul. "John Sutton scores in the League Cup quarter final - it's a yard onside, we don't get it. "I thought today we didn't play fantastic but the boys stuck to the game plan. We needed to be in the game. "In the last 15 minutes we said we'll always get a chance, in every game you always get a chance. The last 15-20 minutes we've defended really well, we've brought big [Stephen] McManus off and just really gone for it. "The result today is for the effort the lads have put in all season because we've had some big downs. One of the worst results in the club's history getting knocked out of the Scottish Cup [by Albion Rovers]. "We've gone to Dundee United and lost five, been beaten at home to Celtic by five, and we've always bounced back. "I'm so proud to be in charge of that group of lads in there. We might not be the best but we've scored lots of goals this season and we go right to the end. We've lost last-minute goals and we've scored last-minute goals, and today it ended up being an incredible result for us. "The end of the season has been outstanding, it's eclipsed anything I've ever done as a manager."